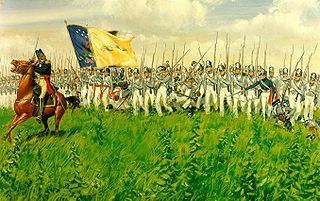 As we review the significant battles commencing in 1812, there is a realization that the name "1812 War" or "War of 1812" is a disservice to those American participants on the battlefields of Canada and across the southern states.The impression of a one year engagement is inherent in the title. It is the only American war that is named and inscribed with a date. Even the British denigrated their involvement and referred to the war as, "The American War of 1812". Presumably, from the English view point, war with Americans, a 25 year enemy, paled when, concurrently, the British forces were engaged far more extensively with France, an implacable 500 year foe. In a sense, the European war mirrored the one with the Americans. Each of the belligerents were asserting national sovereignty, and territory was at issue. The fact remains that the 1812 War was almost three years in length and, in time, far exceeded the United States engagement in World War 1. The distinction between the two wars is evident in terms of casualties. New technologies, from war to war, generation to generation, substantially increased the "kill rate". The 32 month War of 1812 was almost as deadly as the American Revolutionary War which ran almost 9 years. War related casualties in the 1812 War (20,000) were approximately similar to those that perished in the earlier war (25,000). Both in the Revolutionary War and the 1812 War, disease, not the musket, created most deaths. Pneumonia was a particular scourge of American society and extended to its army. Significantly, a further parallel existed. Each of these American wars were fought against the same great power, and each established the sovereignty and territorial integrity of the United States. As in the War for Independence, Americans, with all shades of opinion, were fully engaged. 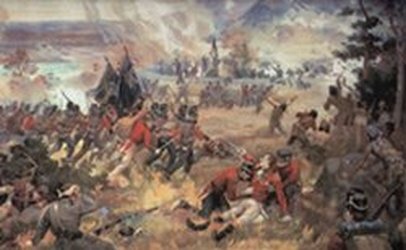 The War of 1812 incorporated three strategies. 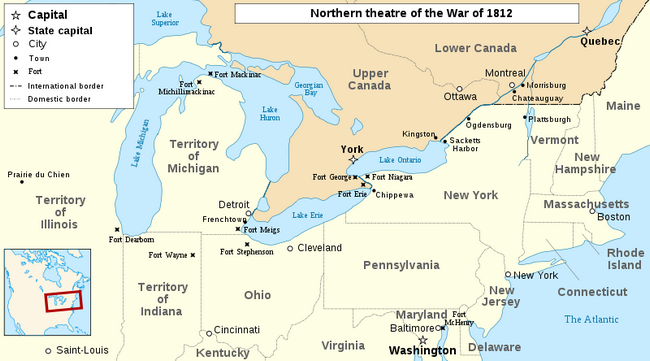 A war in the north mainly focused on the the United States invasion of Canada, the war in the southern states, and the naval battles on the Great Lakes and the high seas. This section deals with the American land war waged against Britain in Canada. It is not intended to exclude the role of the U.S. Navy on the Great Lakes which often coordinated with army activities, and as one of the three grand strategies is given its separate space below. The American mind set had barely changed from colonial times in regards to its economic life and its view of the military. Emphasis on the former and disdain for the latter. Militia meant more to communities, and internal security, than a standing army. This despite an expanded international trade with its potential for conflicts, and the fact that the size of the nation had nearly doubled. In June, the 1812 War began with a regular army of about 5,000 men although congress had approved 10,000 men. The regular army never exceeded 35,000 through the duration of the war. The navy, 16 war ships, was dwarfed by the British fleet, but could boast a competent officer corps supported by experienced crew. Recruitment was a source of competition between the army "regulars" and the militia. The latter, often, operated as the town's male social unit. As we read on, we will note that the states militia policy conflicted with that of the central government. They often refused to cross the Canadian border claiming a Constitutional prohibition that limited their forces to prevent a foreign invasion and not for offensive actions . "The old officers had very generally slunk into either sloth, ignorance, or habits of intemperate drinking". President James Madison's cabinet was also short on military experience. It took the president a year to recruit a more astute staff, and his choices, while somewhat better, still fell short of the experience necessary to prosecute a war. He chose for his Under Secretary of War, John Armstrong and replaced Secretary William Eustis. Apparently, Armstrong, had some organizational strengths, badly required in the cabinet, but was a weak strategist. His appointment to lead the armies, Generals Andrew Jackson, Jacob Brown and William Henry Harrison was a stroke of good fortune. They were aggressive, responsive to battlefield conditions and respected by their men. However, his choice of Armstrong would haunt him when the new Under Secretary failed to provide him with a plan to defend the nation's capital. Madison became the object of derision when the city of Washington fell to the British (1814). President Madison's well remembered reputation as a war time leader left a great deal to be desired. As indicated above, the 1812 War was divided into three strategic areas: the northwest and Canada, Georgia and the south, and battling the British naval blockade that was strangling United States trade. Some viewed Canada as an extension of the United States and should be annexed, and others believed its conquest would merely be a chip in a grand bargain with Great Britain that would eliminate their interests south of the Great Lakes. Canada seemed to be "easy pickings". The British were undermanned with their resources dedicated to defeating the French in Europe. The Americans had already experienced the heady taste of victory against the British Indian allies in the northwest territory (now Indiana) prior to 1812 hostilities. . General William Henry Harrison had successfully defeated the Shawnee Indians led by Chief Tecumseh's brother, known as the "prophet" at Tippecanoe. The American forces had successfully repulsed Indian attacks that forced the tribes to abandon the battle field on November 6, 1811. Americans in the south and west strongly supported a Canadian invasion to begin its conquest of all British controlled lands on the American continent. Madison appointed the Michigan territorial governor, William Hull, to command the American North Western Army under the overall command of Maj. General Henry Dearborn. His plan was to strike Canada with four separate invasion forces. Detroit was the jumping off point for Brigadier General Hull's forces. Until 1796, Fort Detroit had been a center for British administration and a large center for fur trading. Hull reached Detroit on July 5 with about 2,000 troops---mostly militia men from Ohio. Hull had pre- shipped his baggage to Detroit which, unknown to him, had been captured by the British aboard a schooner on Lake Detroit three days earlier. His personal belongs contained his forthcoming war strategies which now were in the possession of the British. . 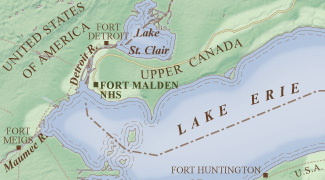 Hull began the campaign on July12, with his forces crossing the Detroit River and entered Canadian territory and occupied the village of Sandwich (currently Windsor). He was now in position to move on the British Fort Amherstburg (a/k/a Fort Malden) on the Lake Erie shore. This fort held about 300 personnel and was ripe for the taking. However they were reinforced by the aggressive British forces under Major Isaac Brock.. His intervention created the danger of cutting off Hull's supply lines and halted American advances. To compound his problems, his militia troops refused to participate in an attack on foreign soil. Hull, whose family were housed in Detroit, became unnerved with stories of Indian massacres led by Tecumseh. He returned his men to Detroit and en route were attacked by the Indians which undoubtedly heightened his fears. The wily British General Isaac Brock sensed the weakness and engaged in psychological warfare aimed at inflating his own strength. He followed Hull with his forces and commenced a bombardment of Detroit after an initial refusal to surrender. No fire was returned by the Americans and Hull unceremoniously surrendered his 2,000 soldiers on August 16. General Brock extended protections to his prisoners from Indian excesses and declared that all the Michigan territory was British. Brock had gained a sound alliance with Native Americans a month earlier (July 17) when he impressively surprised Fort Mackinac, in current Michigan, and accepted their surrender. 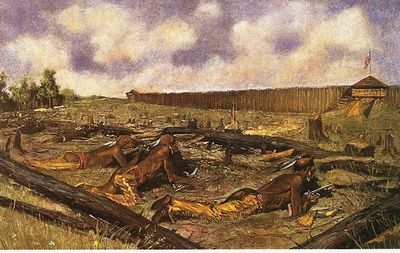 The bad news from Detroit was soon amplified by the Indian massacre of Americans at Fort Dearborn, (now Chicago). The fort had been named by General Dearborn in a display of self aggrandizement. Thus this phase of the western Canadian strategy ended in a net loss. The minimal forces of British regulars augmented by native Indians and Canadian settlers--many former American loyalists in the War for Independence--effectively halted the American offensive with an assist from the onset of winter. Author Jeremy Black in his treatise on the 1812 War astutely noted that Americans seemed to fight best--and successfully--when they were battling from defensive positions and less effective when on the offensive. While fellow Americans were suffering defeats on the western edge of the Canadian strategy, the Americans on the central front were preparing to cross the Niagara River during October 1812. This river flows between Lake Erie and Lake Ontario. It divides the province of Ontario from New York State. The Western Canadian theater of operation was known as "Upper Canada" and the eastern portion, "Lower Canada". General Dearborn's target on the Canadian side of the Niagara River was Queenstown. He intended to transport about 6,000 Americans, mostly untrained militia, across the tricky river tides. He decided on a night time crossing on October 11 only to discover that the oars for the boats were missing. The weather was inclement, and on the second night, his next in command, the inexperienced Stephen Van Renssalaer, was to lead the attack. On the third night, the officer found that there was an insufficient number of boats, and only boarded about 800 men under the command of a young Lt. Col. Winfield Scott who began the crossing short of men and ammunition. The British garrison responded and inflicted heavy casualties on the Americans. Scott was able to rally his force and gained the heights above the fort. General Isaac Brock had reinforced the fort and established a mobile force that had been rapidly moved from the west to the central front. Effectively, he established a mobile national force instead of troops confined to a sector. However, his blossoming career was short lived when struck by an American bullet and died on the battlefield. His loss left strategic conflicts in the British leadership and disillusion in the ranks. Ultimately, relations with their Indian allies deteriorated. The Governor in Chief of the British territories, Sir Gerge Prevost, situated in the north, was ready to seek peace at the expense of the Indian Nations. This undercut British forces in the field and effectively stalled British successes on the western front. "I rode in all directions-urged men by every consideration to pass over, but in vain". Scott was forced to surrender and snatched defeat from victory. Dearborn was focused on the central front despite the failure of the earlier attempt to take Queenstown. Instead of the short route from Fort Niagara, his attack was launched further east from Sacket's Harbor, New York (April 25, 1813). This required the long passage over Lake Ontario to strike York (Toronto) and required 2 days for the flotilla to make landfall. Dearborn ordered Gen. Zebulon Pike to attack York, the capital of Upper Canada. On April 25, he ordered a bombardment of the town. This target was a substitute for proposed actions to capture Montreal. Dearborn substituted York for Montreal relying on poor intelligence that inflated the strength of the British around Montreal. Later in the fall of the year an attempt to take Montreal from Sackett's Harbor and Plattsburg, New York fizzled. The American troops attacked York under the cover of cannon fire quickly overcame the resistance of a small mixed force of British and Indian defenders. Misfortune struck the Americans when a munitions magazine exploded that caused hundreds of death including Gen. Pike. There was no evidence pointing to a cause, but the Americans were wild with anger. Over a period of 4 days they systematically torched the capital and the anchored British ships. The British now had a "remember" day in the following year as they burned Washington. The American success at York, emboldened them to attack Fort George (May) on the Niagara River lying upstream from the American Fort Niagara. The British fort's 1,000 men detachment were subjected to a heavy bombardment from ships under the command of Commodore Isaac Chauncey. 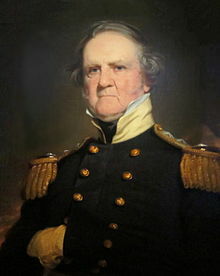 The American landing was led by Col. Winfield Scott. The out gunned fort was abandoned by the British who escaped to fight another day. By December, the British regained control of the Lake Ontario area and recaptured Fort George and took Fort Niagara as well. "Mild and hospitable when at peace, though merciless in war beyond any known degree of human ferocity". The Meigs fort held a significance for Proctor not only because it garrisoned American troops, but because of its location it was a threat to Proctor's Fort Malden. In July, Proctor attempted an assault again on Meigs with the same result. He was forced to withdraw. Suddenly, the stalemate ended. An American naval victory provided the Americans with control of the northwest and a foot hold in Upper Canada. 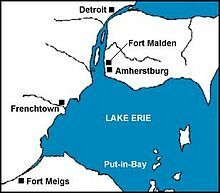 Perry's victory (September) on Lake Erie had destroyed a British fleet which effectively cut off Fort Malden's supply lines.. Proctor retreated to the heavily forested Thames River area and abandoned his fort to the Americans in September. Tecumseh rightly felt betrayed. His dream of an undisputed Indian territory that had been promised by the British was lost.. His options were few. He reluctantly followed Proctor to reputed refuge at the Thames River. General Harrison was in hot pursuit of Proctor and his much diminished manpower and caught him at the Thames River. Governor Prevost, ever cautious, had failed to furnish reinforcements following orders from London to expend manpower to support a defensive strategy, and not be utilized for offensive actions. Later, Prevost proved to be a harsh critic of Proctor. In a one hour battle on September 24, featuring a classic European 2 line infantry defensive formation in a forest clearing, (some historians cite October 5), the battle was decided. Harrison overpowered the British, but took longer to defeat the Indians. Tecumseh died in the fight, but his body was never recovered. The Indian chief's battle with the 'long knives" (Americans) was over. Colonel Richard Johnson claimed credit for the shot that brought down Tecumseh and parlayed that claim into a political career. The Thames battle sorely frayed the Anglo-Indian military relations. As for Proctor, he escaped into the arms of a British court-martial that suspended his rank for 6 months for "lacking judgment". Harrison now moved into the political arena in Washington with hero status as the savior of the American northwest. The American northwest "gateway" to Canada was safe from British trespass. During the autumn, two American attempts failed to seize Kingston and Montreal when Gen. Wade Hampton was forced to retreat at Chateauguay River. This defeat was repeated by Gen. James Wilkinson at Chrysler's Farm in a battle with a heavy American advantage in man power. This latter battle ended any American strategy to gain Montreal and was memorialized to the fallen below. In early September, Prevost marched his forces to Plattsburg on Lake Champlain. This had been a staging area for many American campaigns aimed at Canadia. Prevost failed to coordinate his attack with the Great Lakes naval battle which was already underway, and their defeat greeted Prevost. His intelligence of the terrain was faulty. His attacks met stiff American resistance. The Americans burned bridges and set strong defenses. Plattsburg is considered one of the hardest fought battles of the war. The Americans had learned the value of disseminating false intelligence. After all, General Brock had induced the surrender of Detroit with intelligence that spooked General Hull. The Americans had cleverly "allowed" a letter to fall into the hands of Governor Prevost. The letter asserted that 10,000 American reinforcements were near at hand. The congenitally cautious Prevost took the bait. He withdrew his forces to Montreal and the British invasion had failed. 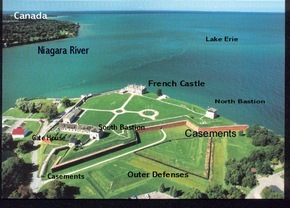 On July 3, Gen. Jacob Brown with a large force crossed the Niagara River and captured Fort Erie. His subordinate, newly promoted, Brig. General Winfield Scott, was surprised by a British unit at the Chippawa River ( for some historians Chippewa). Scott had emphasized repeated drill during training periods of the 1,000 men in his command. His men executed a well disciplined charge and broke the British ranks. British casualties----441; American casualties----275. On July 24, General Brown set his sights on the Queenstown area where a young Colonel Scott had suffered a defeat in 1812. Poor intelligence failed to reveal a heavy concentration of British forces at the western end of Lake Ontario. They met Brown at the intersection of the Queenstown Road and Lundy Lane. Although the battle was fierce neither side could claim victory. British Casualties---878; American Casualties---854 included a wounded Scott and Brown. 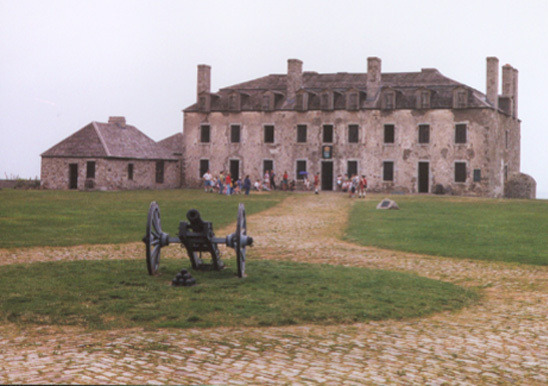 Nevertheless, the Americans were able to maintain a tenuous hold on Canadian territory when they retained possession of the British Fort Erie (August 2). The Americans abandoned Fort Erie on November 5 ending American presence on the Central front of Canada. 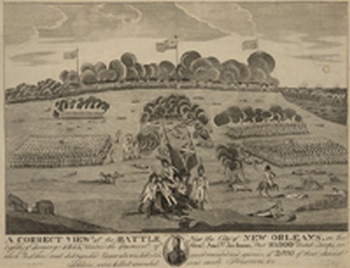 The British plan called for an attack on New Orleans. If successful, it would cut off the west from the Atlantic states, reassert British power in that area, and cut the trade that flowed through the Mississippi valley. Additionally, the plan called for a coordinated land and sea attack against the major coastal cities from Baltimore to Savannah. Essentially, these attacks against cities were intended to bring the war to Americans who were untouched by the human cost of war and induce them to call for end to the war . Historically, General Andrew Jackson dominated 1814. However, there is a sub text which catapulted him to fame. In 1812, the Creek Indians occupied lands throughout central Georgia, Florida and Alabama. Tecumseh in 1811, had visited the southern tribe seeking an alliance with them against Americans. His journey produced mixed results. The older generation had rejected the confederation and the younger Braves were anxious to confront the "long knives" to save their ancestral hunting grounds. One Creek Indian band had participated (1813) in the Raisin River Massacre. "Brave Tennesseans! Your frontier is threatened with invasion by a savage foe"! During the first six months of the campaign, both sides were plagued with problems. The Indians lacked artillery (although had been supplied with small arms by Spanish authorities in Florida), and the Americans had food shortages. Jackson was afflicted with dysentery, but managed small victories. My people are no more". Jackson learned that the British were staging troops at Pensacola (Florida's northern panhandle area). He understood that this was preparatory to an attack on New Orleans. It also was evident that the port at Mobile was a gateway to New Orleans and Jackson fortified its guardian, Fort Bowyer. The British moved on Mobile and the attack was thwarted on September 15, 1814. Jackson believed that Pensacola would still be significant to the British in their attack on New Orleans. However, it was a Spanish possession, and the Madison administration was loath to involve Spain in the war as a British ally. 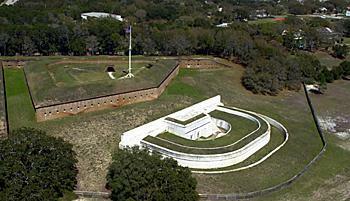 Jackson, without administration support, mounted an attack on Pensacola which surrendered. A small force of British troops escaped. As a result of the Creek War, Jackson was promoted to the rank of Major General and given command of the Seventh Military District covering Tennessee, Louisiana and Mississippi territory. In June 1814, the British executed its plan to strike southern coastal cities. The American Chesapeake fleet of small boats and barges had already been destroyed The first strike was led by Major General Robert Ross. He landed with 4,000 veterans of the Napoleonic war on the Maryland coast. He met with no resistance as he moved toward Washington. On August 22, American General William Winder assembled a larger blocking force at Bladensburg. Despite numerical and terrain advantages his forces were routed, and left the road open to Washington with no American resistance. On August 24-25,British burned major public buildings and looted Washington. The British retaliated for the American burning of York (Toronto, Canada). On September 12, General Ross, fresh off earlier Maryland victories, met an American blocking force south of Baltimore. The city's defenses had been strengthened and checked the British advance. Ross was killed in the battle. On September 13, an overnight bombardment commenced the British attack on Fort McHenry. The history of the stout defense found expression in the national anthem. The British decided that a further land attack would be too costly. Their fleet sailed off to Jamaica where they readied 10,000 men for the attack on New Orleans. On December 23, Jackson commenced a night attack on British troops advancing from a position about 15 miles from New Orleans. Jackson was supported by cannon from the gunboat Carolina and temporarily halted the British. This strategy bought time to erect defensive positions along a one mile front just south of New Orleans where the Jackson forces dug in. His troops were diverse elements of Americans, slaves, Choctaw Indians supported by 1,000 riflemen from Kentucky. On January 1 of the new year, Maj. General Edward Pakenham traded artillery volleys with the Americans. The Jackson artillery was more successful. Nevertheless, the British general led a frontal assault across open ground and was killed along with 290 British soldiers. A simultaneous attack was mounted against the American riflemen. After one hour the battle was decided. The British were forced to retreat. Post Script: The retreating British retreated toward Mobile where in the second battle of Fort Bowyer they seized the garrison. On February 14, they learned the war was over on the previous December 24, 1814. 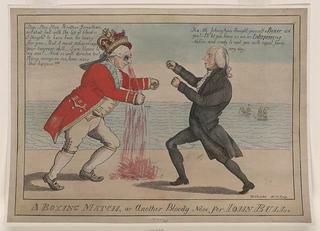 After two wars in consecutive centuries, the British and Americans never again faced each other in battle. The American Navy ranged over a battle front from the Great Lakes to international oceans. Their mission was to participate with American land forces in the attacks on Canadian soil. They bombarded enemy defensive positions, and sought to break the British blockade that was stifling American trade. Even before the war began, America had all but acknowledged the supremacy of the British navy. Britain boasted over 1000 war ready ships, many huge ships of the line, and a force of 150,000 sailors. Contrast that with America's 16 ships and barely 5000 seamen. Fortunately, most of the British ships were designated for duty against their French enemy. Shades of French assistance, albeit not voluntarily offered to the United States in 1812, as it did during the American Revolutionary War. The lives of the ordinary seamen in both navies could not be more diverse. Americans served as volunteers. British seamen often served involuntarily. Many were foreign and forced into British service. This distinction led to severe punishments for their sailors and easier restrictions aboard U.S. ships. American Naval directives conceded their inferiority in numbers and planned missions for their ships that would avoid contact with the Royal Navy. Their orders were to concentrate on British merchant vessels carrying supplies to Canada. However, war plans have unintended consequences. Privateers (privately owned), converted into warships, prowled the seas looking for British cargo ships. A capture meant prize money for captain and crew. Their activities were encouraged by the U.S. government and given protection against charges of piracy when the vessel was commissioned. If captured, the crew would be treated as prisoners of war. The USS Essex began its life that way. Its captain, David Porter, had learned the trade as a young midshipman aboard the USS Constitution. His area of operation was the Pacific Ocean and became the first U.S. ship to round the Cape of Good Hope. He concentrated on attacking British whaling interests and his ship's reputation had upset the British admiralty. His frigate finally was captured in March 1814 and ended its exploits. The rules of sea engagement were quite different then battle on the land. On the sea, captured officers were treated with great courtesy and appreciated for their bravery. When captured and then paroled, a ship's captain was returned to his country, and as a matter of form, was subjected to a court-martial (more of a court of inquiry) no matter the cause of his defeat. Much of the success of the Americans was due to their dependence on gunnery drills. This improved performance under fire. The British captains seemed to put more stock in appearance and less in training. Nevertheless, there was no shortage of courage in the officer class of both navies. Officers were supposed to expose themselves in harms way. In 70% of the battles, officers were usually numbered in the casualties and often resulted in their deaths. On July 16, the Constitution, under the astute seamanship of its commander, Isaac Hull, was forced to flee 5 British warships while also fighting mother nature.. There was no wind. He managed over 2 days to evade and outrun the enemy. He gained safe harbor in Boston after out running and out thinking a British fleet for 60 hours. The ship's captain, Isaac Hull, was soon back scouring the sea for British cargo ships in the Atlantic Ocean. On August 16, the HMS Guerriere, a 38 gun frigate, was spotted by the Constitution in the Atlantic Ocean. Battle was joined three days later. British cannon balls seemed to glance off the Constitution's hull while American cannon devastated the British boat which was forced to surrender. The frigate was known for speed, but as a moderate sized ship built for convoy duty, was no match for the Constitution. Among the prisoners taken were 10 impressed American sailors. The Constitution's mission to capture British cargo ships now established itself as a threat to the Royal Navy. The story of the strength of the Constitution's metal, reinforced hull gave rise to the name, "Old Ironsides". On October 18, a strange chain of events quickly evolved. Earlier in the day, the USS Wasp engaged HMS Frolic in the Atlantic. Both were evenly matched 18 gun frigates. The ships fired broadsides and ultimately the Americans were victorious and took possession of the Frolic which now became the USS Frolic. On the same day, the U.S. Frolic crew was spotted by the 74 gun HMS Poutiers. No contest. The Frolic, captured, again became HMS Frolic. On October 25, the USS United States was patrolling the Atlantic off the coast of Africa. Their lookout spotted HMS Macedonian, and Captain Stephen Decatur prepared for battle which lasted for over 2 hours. This engagement was particularly bloody and the victory has been celebrated by the Naval Academy ever since. 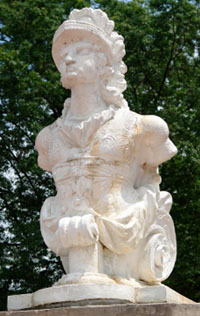 The image of the wood carved bow figurehead of the most famous Macedonian, Alexander, is preserved at the Academy. On December 29, the USS Constitution found another prey. The HMS Java was sailing off the northern coast of South America. An English frigate built along the lines of the HMS Guerriere had met the same fate. The British admiralty after receiving the report of the defeat ordered that engagements with the Constitution should only be undertaken with multiple war ships. At 2.10. P.M,	Commenced The Action within good grape and Canister distance. The enemy to windward (but much farther than I wished). At 2.40.	determined to close with the Enemy, notwithstanding her rakeing, set the Fore sail & Luff'd up close to him. At 4.5	Having silenced the fire of the enemy completely and his colours in main Rigging being [down] Supposed he had Struck, Then hawl'd about the Courses to shoot ahead to repair our rigging, which was extremely cut, leaving the enemy a complete wreck, soon after discovered that The enemies flag was still flying hove too to repair Some of our damages. At 4.20. The Enemies Main Mast went by the board. On February 24, the USS Hornet engaged the HMS Peacock. Commandant James Lawrence, after exchanging broadsides with the Peacock, rammed his bow into the stern of the British ship rendering shot from that source impossible. The Hornet then had an open field for its guns and the battle ended in four minutes. The British Captain perished. His boat could not be salvaged and it sunk in a shallow grave. On June 1, HMS Shannon, a 38 gun frigate, was on blockade duty outside of Boston Harbor. The USS Chesapeake was attempting to run the blockade and was met by the Shannon. they exchanged deadly broadsides resulting in heavy casualties. 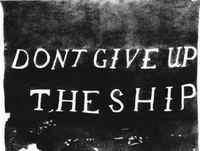 Captain James Lawrence, formerly master of USS Hornet, was struck and died--not before he issued his last order, "Don't give up the ship". The British boarded the Chesapeake and took control. 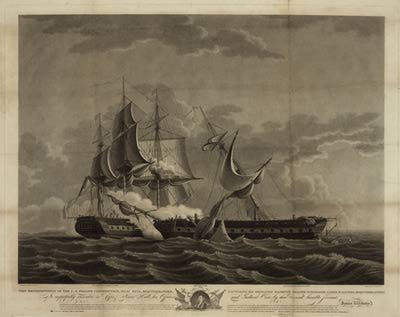 On August 5, the armed privateer, Decatur, spotted HMS Dominica escorting a British merchant ship off Bermuda. The Dominica had a gun advantage. 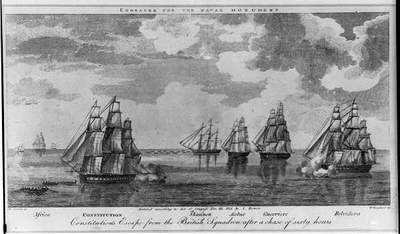 After fierce broadsides, there was hand to hand fighting won by the Americans who captured the Dominica. On August 14, the Americans suffered another defeat. HMS Pelican met USS Argus, a very successful raider of British shipping. Its Captain, William Allen, had been an officer on the USS United States when it captured the Macedonia. Not as fortunate as master of the Argus, he died in the battle and his ship was captured. On September 5, the USS Enterprise, patrolled a a strip of ocean in sight of the Maine coast. Earlier in the day, HMS Boxer was spotted. Both vessels were captained by young men. Captain Blyth of the Boxer was a thorn in the side of American ships. He already had five American merchantmen prizes to his credit. He also had a reputation for courage and chivalry. About two months earlier, he had volunteered to be a pall bearer at the funeral of William Lawrence, captain of the captured USS Chesapeake. In "Knights of the Sea", the author refers to this as a brotherhood of the officers. The ships poured fire into each other. Early in the battle, a cannon ball directly struck Blyth and he expired immediately. The fight continued. Lt. Burrows, commanding the Enterprise was also struck and continued to give orders until he expired. Spectators on the shore were unsure of the results until word reached them of the victory of the Enterprise. On September 10, an epic battle raged on Lake Erie. 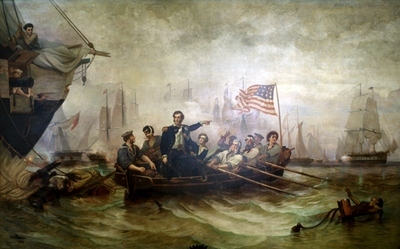 The resulting American victory cemented their control of Lake Erie, instrumental in the British defeat at the Battle of Thames, and the recovery of Detroit. The battle began about noon on that day. 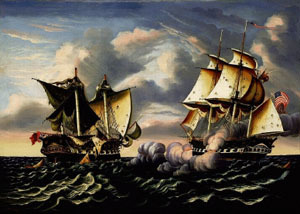 Master Commandant Oliver Hazard Perry led an American squadron of nine boats matched against the six British ships commanded by Commander Robert Barclay. Perry was at anchorage in a harbor known as Put-In-Bay off the Ohio coast. The first shots were fired by Barclay. Perry's flagship, the brig, Lawrence, did not fare well in the ensuing battle and was reduced to a wreck. He was forced to transfer his command to the Niagara along with his personal pennant, "Don't give up the ship". Reputedly the last words of Captain Lawrence on the ill fated Chesapeake. The ships maintained heavy fire and ultimately the Americans were successful. Perry's courage and seamanship were critical. As the battle turned against the Americans, he ordered the Niagara to charge into the center of the British ships with all guns blazing. His flotilla followed. The British fleet was decimated. The decision to row to the Niagara in mid battle was extremely unusual and the product of a quick decision under supreme pressure. On April 28, the USS Peacock intercepted the lightly armed HMS Epervier escorting two merchant ships off the Florida coast. The short battle was a one sided victory for the Americans. At a later British court martial, the verdict found the Pervier to be "the worst in the navy". It's crew consisted of hospital invalids. 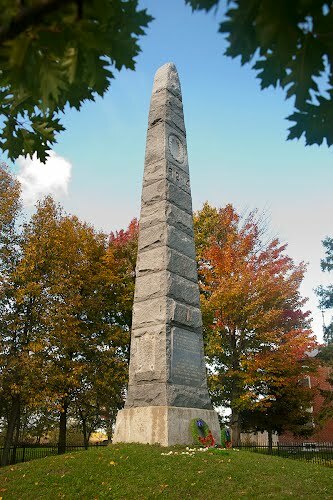 On September 11, the cautious Sir George Prevost, Governor General of the Canadas, possibly responding to the news of Napoleon's defeat, shed his tentative demeanor and attempted an attack on Plattsburg, New York. He employed a flotilla to create a simultaneous land invasion aided by his superior fleet on Lake Champlain at the eastern end of Lake Ontario. 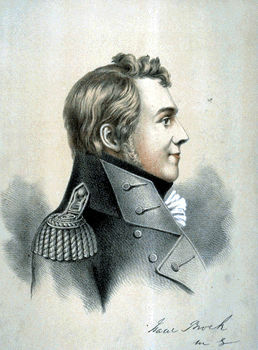 Lt. Thomas Macdonough thwarted the lake action in which the British commander was killed. The British commanders surrendered their swords to Macdonough, and in the spirit of the sea he courteously refused the proffer. Prevost had failed to coordinate his attack with his land operation. On January 15, the USS President was commanded by Stephen Decatur, transferred from the USS United States having established a stellar reputation. His ship was attempting to break through a New York blockade and foundered on a sand bar. The damage was serious although he exchanged fire with the British. Unable to right the ship, he was forced to surrender it. Held temporarily as a prisoner, he was released as the war ended. He was acquitted at a court martial. Unfortunately, this fine commander met his end in a duel over a private matter. On February 20, not realizing that war was over, the still active Constitution under Captain Charles Stewart, met the HMS Cyane in mid Atlantic. The American vessel raked the Cyane and forced its surrender. The numerous victories of the American Navy, mainly in single combat, cannot avoid the fact that the cumulative effect of the British Navy had decimated American trade, depressed the economy in the north, and created tremendous losses to its shipping industry. American Eras 1783-1815. Matthew J. Bruccoli & Richard Layman, Ed, Gale Research 1997. Black, Jeremy The War of 1812, In the Age of Napoleon, University of Oklahoma, Norman 2009. Greenblatt, Miriam. War of 1812, updated edition, 2003 Facts On File, Inc. New York 2003. Hanna, David. Knights of the Sea, New American Library, New York 2012. Heidler, David S., Heidler, Jeanne T. The War of 1812, Greenwood Press, Westport, Ct 2002. Hunt, Gallard. As We Were, Life in America 1814, Berkshire House, Stockbridge, Mass 1993.